This is the second article I’ve written regarding what is clearly a UFO-debunking series on the Smithsonian Channel. The first one, titled I’m Not a UFO Expert but I Play One on TV, addressed the Smithsonian organization’s longstanding efforts to dismiss the reality of the UFO phenomenon via its publication of factually-inaccurate, propagandistic books and by broadcasting intentionally-biased “documentaries” on the subject. Perhaps significantly, the late Frederick C. Durant III, who served as an assistant director of the Smithsonian’s National Air and Space Museum for many years, had also worked for the CIA and authored the 1953 Robertson Panel Report, summarizing a group of agency-sponsored scientists’ recommendations that UFOs be secretly debunked and the mass media utilized to achieve that end. Regarding Smithsonian’s UFOs Declassified series—which repeatedly engages in the misstatement of facts, the omission of other key facts, and the use of unqualified “experts” to dismiss the reality of UFOs as an anomalous phenomenon—the question is whether this abysmal offering, episode after episode, is merely the product of uninformed, biased network executives and their contracted producers, or instead due to the efforts of hidden instigators covertly working for the CIA. While skeptics may scoff at the latter suggestion, the agency’s decades-long practice of embedding its employees in legitimate media companies—with or without the knowledge of those organizations’ management—has been firmly established and was briefly investigated by the U.S. Senate, in 1975, during the Church Committee hearings. Watergate reporter Carl Bernstein’s examination of this ominous situation is a must-read for anyone wishing to understand how much clandestine influence the CIA has exerted on U.S. print and broadcast organizations since World War II. In any case, given the evidence, the Robertson Panel’s recommendations were apparently implemented, and the CIA’s decades-long use of the media to discredit the UFO phenomenon is now well documented in The Missing Times: News Media Complicity in the UFO Cover-Up , by the late journalist Terry Hansen, available at Amazon as a $2.99 e-book. This illustration of the agency’s covert efforts to mislead the American public on the UFO topic, using the mass media, is only one of many that have now come to light. Moreover, and importantly, the history of the CIA’s still-classified interest in UFOs, and what appears to be its central role in the official cover-up by various groups within U.S. government, has been exposed by a variety of means, including document releases via the Freedom of Information Act, inadvertent leaks, and the occasional admission by one former agency employee or another. All of these have been examined in a chapter of my book, UFOs and Nukes, which has recently been posted online. In short, the official version of history—whereby the CIA was only peripherally concerned by the UFO phenomenon, leaving the investigation of it to the U.S. Air Force—has been convincingly exposed as pure fiction. Nevertheless, the mainstream media continue to publish and broadcast stories originating from the agency—as recently as 2014—which serve to cast doubt on the UFO reality while simultaneously downplaying or ignoring CIA’s ongoing, still-hidden interest in the subject. Regardless, a recent, suspiciously-spun episode of Smithsonian Channel’s UFOs Declassified, titled “Pilot Eyewitness”, presents three well-known cases involving commercial pilots who sighted one or more UFOs near their aircraft and, after superficially examining each incident, dismisses two of them as due to errors in human perception, suspect witness testimony and/or the misinterpretation of radar data. The exception was the 2007 incident over the English Channel, during which Aurigny Air Services pilot Ray Bowyer reported seeing two huge, cigar-shaped UFOs which also appeared on ground-based radar. According to the show’s producers, that case will probably “forever remain a mystery”, which is the safest way to avoid saying that the two enormous craft—observed by the pilots of two different aircraft and all of the passengers in one of them—were, as the evidence strongly suggests, bona fide UFOs. But the case that caught my attention—the one which best exposes the TV series’ continuing efforts to dismiss the phenomenon’s anomalous nature, while at the same time misrepresenting the real purpose behind extreme military and intelligence community interest in UFOs—is the 1986 Japan Airlines incident over Alaska. The veteran pilot, Captain Kenju Terauchi, was the only one, in a crew of three, to report a structured craft—a huge, dark, walnut-shaped ship having lights around a central rim—whereas the others only reported the lights. The inference being that Terauchi only imagined an unlit craft to which the lights were attached—a phantom that didn’t really exist. But Dr. Richard Haines, a retired psychologist and Unidentified Aerial Phenomena (UAP) researcher who interviewed Terauchi at length, says, “He was on the left side where the huge object was positioned and I don't believe his First Officer left his seat to come over to look out of that window.” In other words, if Terauchi provided a more detailed sighting report than the others, it was due to his having a better look at the unknown craft. The show’s producers also attempted to discredit Captain Terauchi by mentioning his having acknowledged that he had seen other unidentified aerial objects during his careers as both a military and a commercial pilot—as if this fact somehow automatically meant that he was an unreliable observer. Terauchi was a “repeater” the narrator solemnly intoned, clearly implying that his testimony could not be trusted: Someone who reports one UFO is suspect; anyone reporting more than one sighting is quite clearly not credible. In reality, however, large numbers of commercial pilots have reported seeing UFOs, often more than once, but usually only after they had retired, due to the widespread public stigma attached to those who describe seeing strange things in the sky. Indeed, as the pilots themselves have repeatedly said—during interviews appearing in various documentary films in recent years—their careers would probably have been over if they had been as candid as Terauchi. This very valid concern was dramatically reinforced in 1953, when the U.S. Joint Chiefs of Staff—the heads of the military services—promulgated regulation JANAP-146, which ordered military and commercial pilots who had sighted a UFO to immediately file, while still airborne, a CIRVIS (Communications Instructions for Reporting Vital Intelligence Sightings) report. The purpose of such real-time reporting, including a required mention of the unidentified aerial object’s altitude and direction of flight, was to allow the nearest U.S. Air Force base to launch fighters to investigate the sighting. In any case, according to the newspaper article’s author, journalist John Lester, over 400 commercial pilots later added their names to the 50 interviewed for this published protest. All of the pilots requested anonymity but were to be publicly identified once the Joint Chiefs’ policy of secrecy regarding pilot UFO sightings had been lifted; unfortunately it never was. 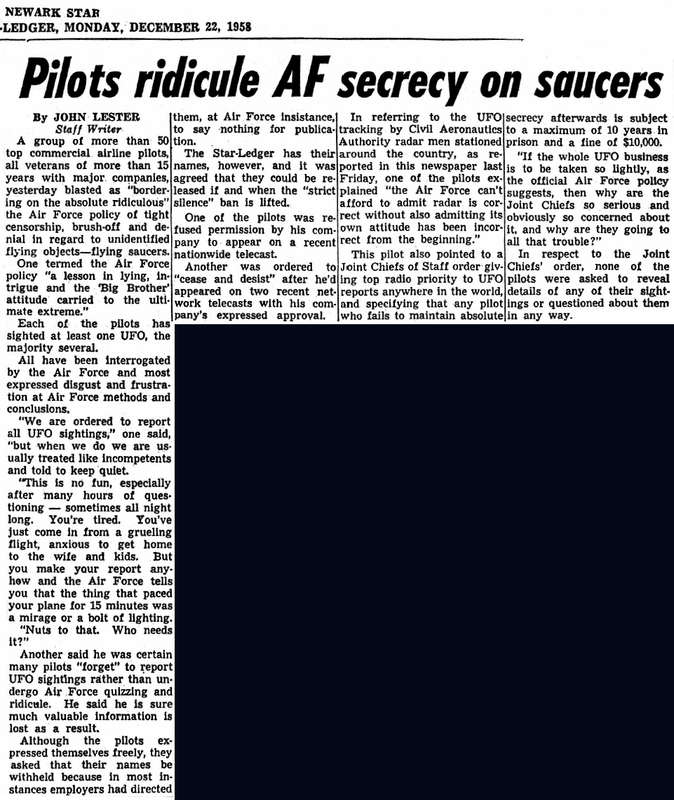 Now, if Smithsonian Channel had wanted to do an honest, historically accurate documentary on UFO sightings by commercial pilots, it could have highlighted the explosive revelations mentioned in the Newark Star-Ledger article, which provide insight into the actual, ongoing situation regarding (government-suppressed) airborne UFO sightings. 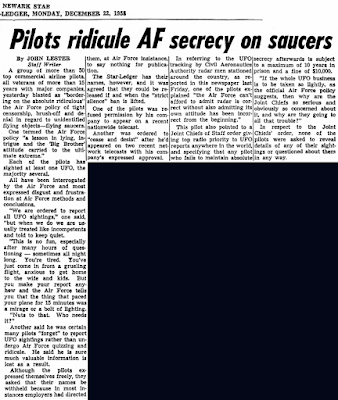 After all, the published piece has been featured in a number of books by UFO researchers over time and, had the producers of UFOs Declassified instructed their research assistants to do a thorough job of investigating the history of pilot UFO sightings, in preparation for the episode, they could not have failed to find references to the article. But, of course, objectively-presented research is clearly not a high priority for this bunch. Instead, the network spent as much of the episode as possible attempting to discredit most of the pilots in the cases it covered, as well as one retired Federal Aviation Administration (FAA) manager, John J. Callahan, who openly and adamantly supports the reality of a bona fide UFO-involvement in one of them—the 1986 Alaskan UFO incident. At that time, Callahan was the FAA’s chief of Accident Investigation and Prevention and was charged with overseeing an analysis of the case. I earlier wrote that the show’s producers presented the Alaskan case in such a way as to downplay the nature of the intelligence community’s interest in the incident. True, the episode did mention Callahan’s public admission that he had been ordered to review the aerial encounter with members of President Ronald Reagan’s scientific advisory team, three FBI agents and three CIA officers, among others, at FAA headquarters in February 1987. So far so good. But given that Callahan has repeatedly discussed this technically-still-classified event in various video interviews, easily accessible on YouTube, it would be difficult for UFOs Declassified not to at least mention it. That omission, were it to occur, would be instantly suspicious to many of the program’s more informed viewers. Nevertheless, a central, very significant portion of Callahan’s public testimony about the meeting was pointedly and very intentionally passed-over by the producers. But does UFOs Declassified mention this very important part of the story? Of course not. If it had, not only would CIA’s central role in the cover-up of the event be exposed—as opposed to the U.S. Air Force or the FBI or any other group—but the reason for the secrecy would also be highlighted—the agency’s deep concern about public panic should the truth emerge. Instead, the show’s producers very deceptively mention that Callahan had asked the CIA officer, just moments before he swore the group to secrecy, what he thought the unidentified object was. “Why, a UFO!” the officer responded. Then the producers pounced: “But did the CIA agent mean that the UFO was an extraterrestrial craft or [just] unidentified?” they asked. Well, if these willing/unwitting shills had honestly told the whole story, it would be quite clear to the audience that the CIA would not have been concerned about public panic if the huge, unknown craft were merely unidentified. But, on the other hand, Americans—at least some number of them—might indeed freak-out if the FAA or some other governmental group acknowledged the extraordinary, almost certainly extraterrestrial nature of the case. This is the kind of very clever, premeditated deception the public can expect from the UFOs Declassified series. While perhaps a few thousand people will read this article, the Smithsonian Channel will garner millions of unsuspecting viewers for its highly-misleading fare. And the CIA, whether covertly involved with this bogus show or not, will be very happy about that.